As you know, the SPGs provide guidance on the implementation of London Plan policy 7.14 – Improving Air Quality, as well as a range of policies that deal with environmental sustainability, health and quality of life. Please consider this response also as a supplementary response to your consultation on proposals for ‘Air quality neutral’ (AQN) which closed recently. In respect of AQN, CAL reiterates its request to the Mayor not to use the National Atmospheric Emissions Inventory for benchmarking in London. Amongst other things – it can be wildly inaccurate. While the Draft SPG would not have formal development plan status, after its consultation period and if it were formally adopted by you as supplementary planning guidance under your powers under the Greater London Authority Act 1999 (as amended) it would be a material consideration in drawing up local and neighbourhood plans and in taking planning decisions. CAL is concerned separately that the Draft SPG is proposing a much weaker package of measures, particularly in relation to NRMM for PM, than was expected by the Mayor’s Air Quality Strategy (MAQS) published on 14 December 2010. The only exception is the introduction of requirements for emissions of oxides of nitrogen (NOx) (which should anyway refer instead to nitrogen dioxide (NO2)). See below for details. The GLA and London Council’s Best Practice Guidance on ‘The Control of Dust and Emissions from Construction and Demolition’ provides one mechanism by which planning can address such issues. It is proposed that this guidance will be reviewed with a view to it being consulted on and published as supplementary guidance to the London Plan. 4.4.1. The BPG  is an important tool to reduce emissions from building demolition and construction sites, which are often located in areas of dense population. For that reason, the Mayor is committed to full implementation of the Guidance by all developers across London. 4.4.2. There are some very good examples of best practice implementation throughout London. Box 17 below highlights examples of initiatives that are being implemented in London boroughs. Through the LAQM process and the updated BPG, the Mayor will encourage the spread of such best practice. The Mayor will work with the Considerate Constructors Scheme to help promote best practice. 4.4.3. The GLA is looking for opportunities to work with Crossrail to undertake a demonstration project that examines the operation of retrofit equipment on NRMM on a London construction site. The knowledge gained from this demonstration, as well as other relevant experiences, studies and reports, both from the UK and abroad, will be used to inform a wider review and update of the BPG, to be completed in 2011 in cooperation with London Councils, boroughs and the construction industry. 4.4.4. This review is expected to be minor, allowing new techniques and best practice that have been developed since 2006 to be included. The review would also create the opportunity for the BPG to become a more streamlined document contained within Supplementary Planning Guidance, which would be easier for boroughs to enforce. In particular, it will provide clear advice on which elements should be regarded as mandatory and should therefore be actively enforced by boroughs, and which elements are advisory. The Mayor, through the GLA, will encourage boroughs and other developers to include the BPG in their agreements and CoCPs. The GLA Group will also include the BPG within procurement policies for all construction projects. Finally the GLA will promote awareness of the BPG through workshops and information on its website. CAL is very concerned that the Draft SPG is sharply inconsistent with expectations set by the MAQS. Most obviously, the Draft SPG is proposing much weaker NRMM standards than would be implemented under the current arrangements from Autumn 2014 i.e. BPG 2006 automatically updates requirements for PM when new NRMM standards are implemented. Worse, the many loopholes and exceptions in the Draft SPG means: the new guidance is little or no stronger than the voluntary code of BPG 2006 already in place; and would allow developers and construction companies to claim they are adopting a new and presumably better standard given the ever increasing concerns about air pollution in London and elsewhere when this would not be the case. Frankly, the Mayor’s approach seems nonsensical unless he wishes to support developers and construction companies over public health and green industries. Having produced a (largely) good ‘Air quality’ Policy 7.14 in the London Plan and deleted the wrong definition of AQN, CAL is gravely concerned you are proposing to take backward steps in the proposed guidance on construction and demolition in the new Sustainable Design and Construction SPG. Mayor Livingstone’s guidance estimated (page 27) that UK emissions in 1999 of oxides of nitrogen (NOx) from diesel NRMM were 71 kilo tonnes (approximately 8% of all road transport emissions) and 7 kilo tonnes of total PM emissions (16% of road transport emissions). A study for the EU estimated that off-road machinery accounted for approximately one-third of PM2.5 emissions from mobile sources in 2000; proportionally equivalent to that from passenger cars. The report forecasts this proportion to rise to 40% by 2020. As you know, PM2.5 is considered to have the greatest health impact on the population as a whole. Your Draft SPG says “The latest version of the London Atmospheric Emissions Inventory estimates that in 2010 the NRMM used on construction sites was responsible for 12% of NOx emissions and 15% of PM10 emissions in Greater London”. This construction (and demolition) sector has long been regarded, like shipping, as ‘low hanging fruit’ in offering one of the cheapest ways for society to reduce harmful pollutants. The ‘Polluter pays’ principle also points to the need to tackle this industry as a major source of deadly air pollution. meanwhile, while laws continue to be breached, public health suffers. Why is the Mayor favouring therefore some of the worst legacy polluters in London when jobs need to be created in modern sectors if London is to lead the world again? BPG 2006 estimated that the use of ultra-low sulphur diesel (ULSD) would ‘automatically reduce particulate emissions by 30%. In addition to this, fitting suitable after treatment devices can reduce the remaining particles by at least 85%. As fine particles, are of great concern to health this is, therefore, a very effective way of reducing any health impacts to workers and sensitive receptors’ i.e. people. The use of ULSD in road transport has been linked to dramatic reductions in particle number concentrations (e.g. in Marylebone Road) and it is an important pre-requisite for the use of abatement equipment. The Draft SPG is confusing in relation to the use of ULSD. For example, there is no mention of it until a reference in an example given on page 82 in relations to the Thames Gateway Bridge. CLA understands that the use of 10 ppm ULSD is compulsory for all NRMM. Please make it a requirement in your guidance irrespective of whether or not it is an EU or UK legal requirement. It seems the Mayor is deliberately timing the Draft SPG to have the greatest likelihood of achieving the worst possible outcome relative to the current BPG 2006 guidance. Under BPG 2006, the standard for all NRMM, with variable speed engines in the Power Band 56 to 560 kW, at High risk sites across Greater London would tighten to Stage IV for PM from as soon as October 2014 (or Stage IIIB at worst). The Mayor is proposing to endorse new standards a month earlier on 1 September 2015 that would remain in place until 1 September 2020. If correct, this is nothing short of astonishing. For more detail, see below. Excluding constant speed engines. Major developments only. Actual 130<kW<560 Stage IIIB Stage IV Stage IV Stage V? Ken – Whole GLA Stage IIIA or IIIB Stage IIIB or IV Stage IIB or IV Stage IV or V5? Actual 56<kW<130 Stage IIIB Stage IIIB Stage IV Stage V? Ken – Whole GLA Stage IIIA or IIIB Stage IIIA or IIIB Stage IIB or IV Stage IV or V? Actual 37<kW< 56 Stage IIIB Stage IIIB Stages IIIB ? Ken – Whole GLA Stage IIIA or IIIB Stage IIIA or IIIB Stage IIIA or IIIB Stage IV or V? Actual 19<kW< 37 Stage IIIA Stage IIIA Stage IIIA Stage IIIB? Boris – GLA No standard No standard Kept under review ? CAZ/CW No standard No standard Kept under review ? Ken Stage II or IIIA Stage II or IIIA Stage II or IIIA Stage IIIA or IIIB? It is very surprising that the Draft SPG appears to define no standards for the next two years i.e. for the period to 1 September 2015. Potential for emissions and dust to have a significant impact on sensitive receptors. 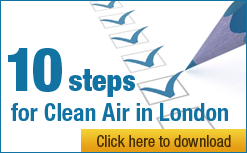 It seems Mayor Johnson is proposing to implement Stage IIIA for the vast majority of Greater London – including in some of the most polluted areas and near some of the most vulnerable people – weeks before the current BPG 2006 would require Stage IIIB or Stage IV for PM (at least) at many ‘High risk’ sites. Further, please rephrase the guidance so it is ‘half full’ not ‘half empty’. In other words, please say the ‘latest standard should be used with a minimum of [looser] standard’ instead of ‘required to meet a minimum [looser] standard’. The strict requirement(s) would be the same but the guidance would be most likely to achieve a better outcome by setting its sights higher. Delaying Stage IIIA across Greater London from 1 July 2014 to 1 July 2015 would more than halve the expected reduction in PM2.5 emissions from 2.0 tonnes to 0.9 tonnes. The combined option from 1 September 2015 reduces the PM2.5 reduction from 34.7 tonnes (compared to Stage IIIB across Greater London) to 21.7 tonnes. Please be more much ambitious. The Draft SPG is sloppy or worse in its use of the word ‘dust’. ‘Dust’ creates an impression for the general public and others of inert, household dust. However, this could not be further from the truth. Carcinogenic outdoor (and indoor) air pollution largely comprises particulate matter which is also carcinogenic. CAL urges the Mayor to stop hiding carcinogenic dangerous airborne particles as ‘dust’. As you know, CAL is concerned that regulatory standards for ‘dust’ are lagging significantly the scientific evidence on health effects. Further, Workplace Exposure Limits are wrongly applied by the Mayor as the standard in places where the public has regular access e.g. London Underground. Please make clear in your guidance the need to apply the precautionary principle for exposure to ‘dust’. CAL confirms its general support for the new guidance to require an Air Quality Statement. However, please make clear – as you do for Air Quality (Dust) Risk Assessments – that you include all particulate matter including PM2.5 and PM10. Please amend the reference to ‘dust and NOx control measures’ which again create confusion by suggesting PM2.5 or PM10 are ‘dust’ (page 24). Please also make clear that the statement must assess against impact against EU limit values for PM10 and NO2 to support ‘Air quality neutral’. The Mayor’s reference to NOx instead of NO2 is sloppy as NO is not considered harmful for health and is not subject to legal requirements or health guidelines. Last but not least, please encourage the use of Air Quality Statements as best practice across London for all developments. CAL confirms its general support for the new guidance to require an ‘Air Quality (Dust) Risk Assessments’ subject to the same comments made above about Air Quality Statements. CAL confirms its general support for the new guidance ‘Dust and emissions control measures’ subject to the same comments made above about Air Quality Statements. CAL is pleased to see the Draft SPG including Site monitoring. However, it must include NO2 and PM2.5 as well as PM10 and focus on protecting public health and ensuring full compliance with limit values instead of avoiding ‘complaints’. CAL considers the 250 ug/m3 and 200 ug/m3 trigger levels hopelessly out of date. CAL confirms its support for the setting of higher standards in the most polluted areas to reduce inequalities and air pollution more widely. In particular, CAL considers that the Central Activity Zone is a better focus than Central London. Please respond to the questions below about the application of the ‘Public sector equality duty’. The attached analysis shows that Stage IIIB is about 10 times tighter than Stage IIIA for PM. There can be no doubt therefore about the consequences of the Mayor’s decision to delay the Stage IIIB requirement for wider Greater London. New construction machine engines should be sold with particle filter systems originally equipped by the manufacturers (OEM). This is cheaper, technically easier and more efficient than retrofitting new construction machines. Existing construction machines should be retrofitted with particle filter systems. An immediate reduction of carcinogenic soot particles is only possible by retrofitting existing machines. The Swiss authorities are pushing for the adoption of Stage V at the same time the Mayor is seeking to enshrine Stage IIIA for most of Greater London until 1 September 2020. The Draft SPG does not seem to refer to the certification of ‘best practices’. Please use the Energy Saving Trust and/or VERT certifications as they are already used for various other schemes in London and elsewhere. Using proven certification schemes would create a stable planning framework for contractors, planners and technology suppliers. CAL urges the Mayor to specify the use of diesel particulate filters, whether OEM or retrofitted, as the minimum requirement for all NRMM throughout Greater London. There is no excuse for not requiring PM abatement: the equipment is cheap, readily available, reliable and effective. Please use the Mayor’s Clean Air Fund to provide ‘Financial and non-financial incentives’ for the use of PM and NOx abatement technologies in those areas where PM10 and NO2 limit values are exceeded. Note that developers and contractors may prefer non-financial incentives. CAL is deeply concerned that the wide range of exemptions and exceptions being proposed by the Mayor. In our view, the extent of these means the current Draft SPG is little or no stronger than the BPG 2006 voluntary guidance already in place. Please remove or make stringent any exemptions. Directive 2008/50/EC on ambient air quality and cleaner air for Europe imposes strict limits for the protection of public health and the environment. Please ensure that the AQN guidance is consistent with that Directive and explicitly mentions it, not least with respect to PM2.5. Please support Commissioner Potočnik by including a mechanism to introduce tighter standards in the Draft SPG as soon as they are implemented. The Mayor does not seem to have considered his obligations under the Public Sector Equality Act when proposing new standards for NRMM. Please therefore explain what, if any, consideration the Mayor has given to advancing the equality of opportunity between persons who share a relevant protected characteristic (e.g. those living in or near one of the Air Quality Focus areas) and persons who do not share it (e.g. those living in or near the Central Activity Zone or Canary Wharf). In particular section 149 (2)(b) states: take steps to meet the needs of persons who do not share it. CAL seeks a formal written response from the Mayor on this matter. You have already taken backwards steps in your second term e.g. scrapping the new standard for NOx for the low emission zone in 2015 that were promised in the Mayor’s Air Quality Strategy and London Plan (in Policy 7.14). You are now proposing to take more backward steps on perhaps the biggest environmental and public health achievement in your first term i.e. the air quality policy in the London Plan. Please therefore address fully the above concerns. If you do not, you will only be able to reduce carcinogenic air pollution and comply with limit values by introducing draconian transport and other measures.